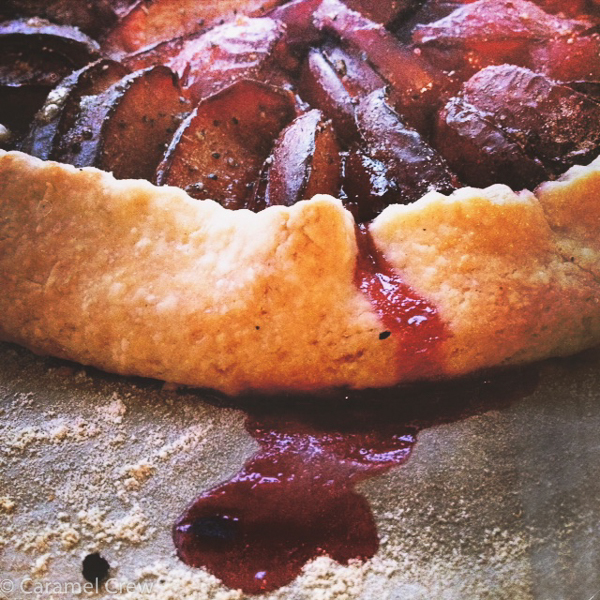 Easy plum galette recipe – this rustic country fruit pie is so delish, simple to make and totally fuss-free. Serve it warm with cold vanilla créme fraiche or vanilla ice cream for maximum pleasure. When you want to eat or serve something rustic, artisanal, and easy, a fruit galette with strong, rich flavors might fit the bill just perfectly. Hey, you won’t even need a pie dish! This easy plum galette recipe is perfect for the impatient baker, since you won’t need surgical pastry chef skills or nineteen different steps to assemble it. Just roll out the simple dough, throw on the plums and fold the edges in. In fact, the finished pie looks better if the folds are a bit uneven and rough, adding to the country feel of this easy pie. My easy plum galette recipe is packed with juicy plums and cardamom, and I use just a bit of brown sugar to sweeten things up a little. 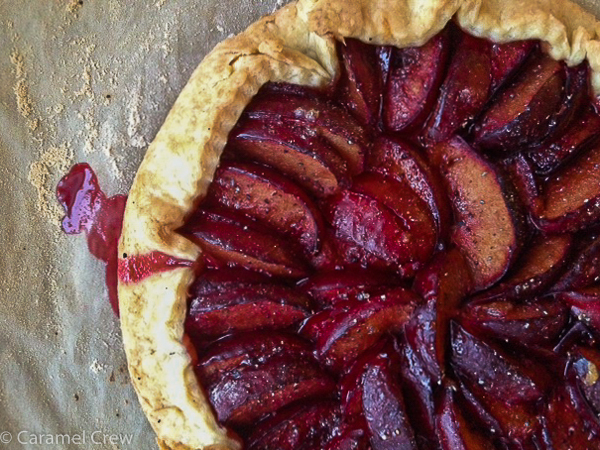 The natural tartness of the plums comes out beautifully in this easy, rustic pie. 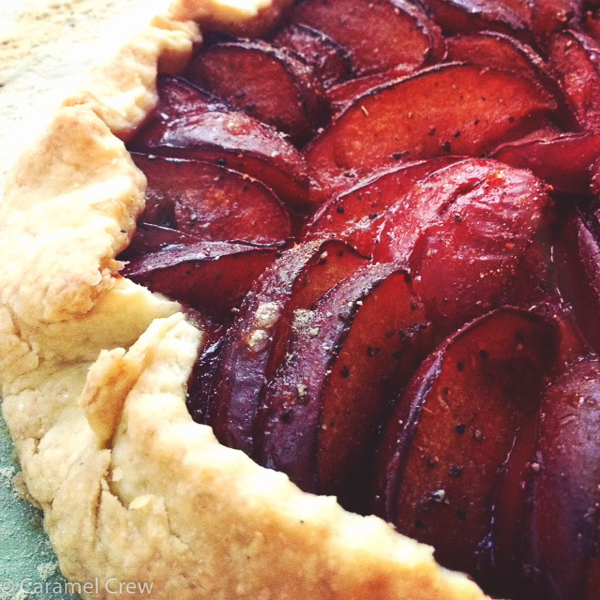 To balance the flavor I usually serve the galette with some crème fraiche spiked with vanilla. The creamy softness of the crème fraiche compliments the plums perfectly and makes sure that the flavors don’t end up tasting too sour. If you prefer a sweeter result, you can always increase the amount of brown sugar, but to me this pie is just right with a little tart twist to it. You can also use other fruit such as peaches or cherries with this recipe. The plum cardamom galette is best served warm and on the day it was made, but it keeps well in the fridge covered with plastic wrap. Just warm the slice in the microwave a couple of seconds before serving. 1. Slice up the plums. 2. Mix flour and sugar in a bowl. With your fingers, break up the cold butter into the flour mix until you have large crumbs throughout. 3. Add the water and gently knead only a bit so the batter starts to come together. Flatten the dough into a disc shape, wrap tightly in plastic wrap and let rest in the fridge for 30 minutes. 4. Place a piece of parchment paper on a baking sheet and lightly flour it. Heat the oven to 400° F.
5. Transfer the dough onto the paper-covered sheet and roll out into a roughly 9″ round. If you want neater edges, cut the rough bits off with a knife. 6. Leaving a 1 inch border from the edge, arrange the plum slices decoratively in a pattern you like, for example in circles. Make sure the slices are tightly packed together to get a moist and juicy filling. 7. Sprinkle the brown sugar and cardamom on the plums. 8. Fold the edges over the plums, making pleats where necessary to keep the edge down. 9. On the lowest rack of the oven, bake for 25-30 minutes or until the edges are a light brown color. 10. Scrape the seeds off the vanilla pod and mix with the crème fraiche, add 1-2 teaspoons of sugar if a sweeter version is preferred. 11. Let the galette cool for a moment and serve with vanilla ice cream or a dollop of vanilla crème fraiche.